How Paper And Color Can Make You Dream. Exclusive Interview With Artist Adele Rahte. I met Adele Rahte at the beautiful Harlem house of a common friend, the soprano Lauren Flanigan. The conversation soon turned from music (we had just the fortune to have witnessed a unique performance of lyrics by Gabriele D’Annunzio put into music by various composers) to art and she promised to give me an interview so that our readers could learn more about her work. The time has come and here is the interview of this marvelous artist who can make you dream with paper and color. Tiziano Thomas Dossena: When did you realize you were going to be an artist? Adele H Rahte: I was fortunate to have parents who valued my creative core. At the age of eight, I was being tutored in the different art mediums. I think I have always been an artist. For example, as a kid, if I did not have any paper to draw on, I would draw on the wall. 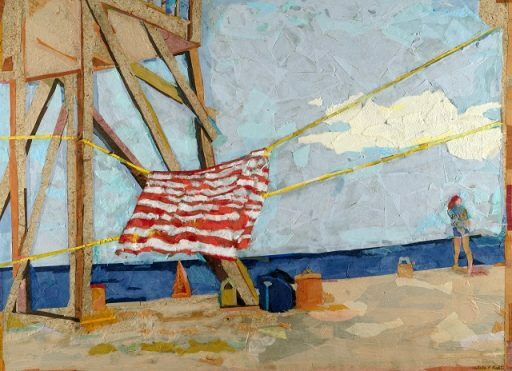 I started with my current technique, which I call “painting with paper,” in 2001 using the mylar I had put up temporarily as a window treatment in my New York City apartment after Sept 11th. Tiziano Thomas Dossena: I detect a strong Impressionist influence in some of your work, and in particular in the seascapes and skyscapes. Do you feel your work has been influenced by various artists? Who? Who is (or are) the artist who you admire the most? 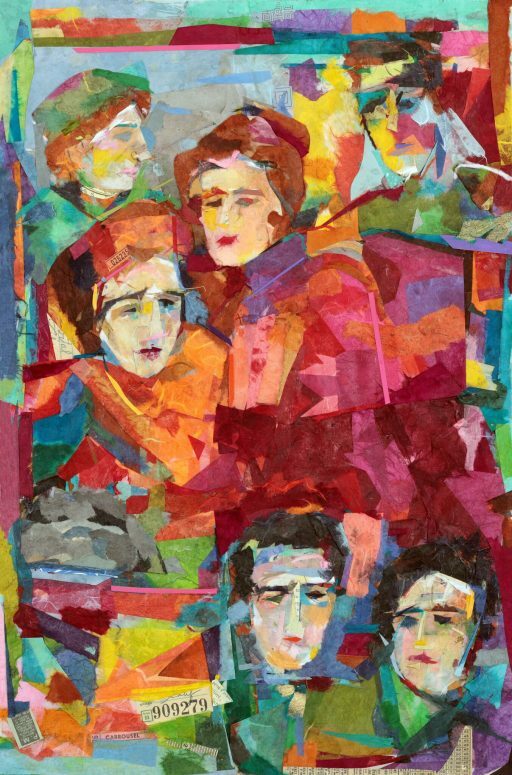 Adele H Rahte: Here in Manhattan I can drop into any of the museums, especially when I am having trouble conveying what I wish to depict. I must understand what I see before the viewer can understand it. The great masters in these museums are always available to teach me how to see and how to present. I find it crucial to my process to see as much art as possible. The Masters who help me see clearly vary with the piece I am working on. For example, Van Gogh guided me in Do You See the Kite?. In Tribeca, Cézanne and Aboard the Uptown 6, it was Modigliani. My favorite art movements are Expressionism, Fauvism, Cubism, Dada, and Suprematism. Tiziano Thomas Dossena: I also detected different stroke usage in various paintings of yours (seascapes/seascapes vs. portraits/flowers/urban landscapes). Could you elaborate on that? Adele H Rahte: “Stroke usage” translates to direction and movement. It is a conscious manipulation, a trick of the eye. It provides the viewer with an understanding of what they are experiencing when they look at 2D art. Since I use paper and not paint, I achieve the “brush stroke concept” by taking advantage of the direction of the fibers or patterns in the paper. 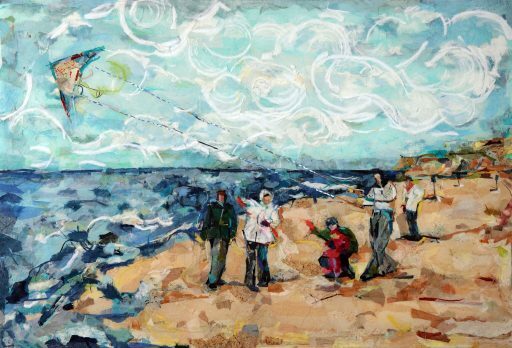 You can see examples of movement in my art in the following pieces: in the towel in At Nauset Beach, and in the people, water and clouds in Do You See the Kite? Do you see the kite? Tiziano Thomas Dossena: Do you start with the concept of adding paper to a painting or is that something that arises in the creative process? (Some paintings seem to be 100% paint and some, instead, seem to be paint and some paper) Could you tell us what is the reason for using the paper in those paintings? 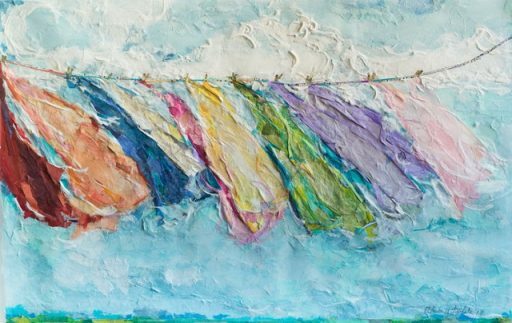 Adele H Rahte: My work is comprised of paper only, no paint. The fibers in the paper fragments meld together. Then the layering of paper fragments is how I control the subtle color differences or create a clear edge. I see the world comprised of blocks of colorful shapes. 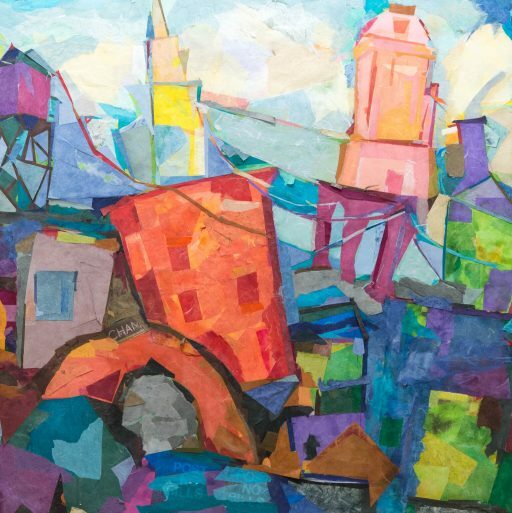 Using paper to create these shapes works for me because I can feel the paper and create the shapes by tearing or cutting the paper fragments into the exact shape my art requires – almost like a sculpture. The clear example of this is seen in Saturday at the Beach. Tiziano Thomas Dossena: You also create complex collages. Could you explain a bit the process involved and the artistic motivation behind this choice? Adele H Rahte: There are endless moves when creating. Every single addition to the piece is living on the edge of life or death, failure or success. It is an amazing dance which is performed. When I am deep into the piece I am creating, I am removed from making art and the art piece itself takes over to the point where it feels to me that the piece is creating itself and I am simply applying the pre-chosen paper fragment. My hand selects the correct fragment from the growing pile of wonderfully colored and textured papers located on the shelf under the artwork I am working on. This scenario is repeated again and again until the piece feels finished. But when is it truly finished? I make a guess and say to myself “ok, now it is finished… well at least for the time being.” If time allows, I can put the piece away and then revisit it later with fresh eyes. Tiziano Thomas Dossena: Do you feel that is the artist in you who influences your photography or is the photographer in you who influences your artwork? Adele H Rahte: My art starts with reality. Somewhere in my minds’ eye, I ponder over a concept, getting preoccupied with it. I carry my camera with me and I then photograph what I need to have to reference. Then while creating the work perhaps years later I have the needed details to complete the piece. If the photograph happens to turn out to be special, then I share it. I did study photography in High School and then at University. Tiziano Thomas Dossena: How much and in what ways have your Italian roots influenced your art? Tiziano Thomas Dossena: Many writers, especially poets, find necessary to be in a particular mood, such as emotional distress, to create their work in an optimal manner. When you paint, how much does your mood influences the art piece’s outcome and in what emotional condition, if so, do you feel you are more creative? Adele H Rahte: I know that creating my art wards off the cloud of depression I can fall prey to. I feel productive, artistic, unique and happy when I am creating. It is a special world of color, texture, and beauty. It is a vast and deep world — both solitary and educational. Tiziano Thomas Dossena: Are you planning any new exhibits in the near future? Any special project you working on?